While working with customers, we’re constantly learning about their needs and managing inquiries that arise. As a result, we’ve included a list of frequently asked questions along with answers in order to provide additional support. If your question isn’t addressed below, get in touch with us and we’ll provide the information you need.  Peter’s Dive Resort is located in Padre Burgos town at the southernmost tip of Leyte Island (province of Southern Leyte), Philippines.The resort is a 45-minute drive from the provincial capital, Maasin City, 75 minutes from Bato (plus another 15 from Hilongos), and three hours from Ormoc City. Is the resort located in a safe area? How is the peace and order situation in your location? Despite the bad press concerning the peace and order situation in the Philippines, particularly in Mindanao, Southern Leyte (along with its neigboring provinces and islands) remains peaceful and has one of the lowest crime rates anywhere in the country. While the resort is located in an area that enjoys fair weather year-round, Please note that the whale shark season is generally late October to early May . Some strong rain can be expected in January and February but diving is still good at this time. In the off season May to October weather is usually excellent but sightings of whale sharks are just occasional. Visibility however is excellent and water temperature around 30. There is no problem diving here all year round. Also please note that our climate in Southern Leyte is different from northern Philippines in respect that we are out of the typhoon belt that influences Luzon and the Bicol Region some times of the year. Unless you prefer using your own gear, the resort has all the dive equipment you will need. What is the fastest way to get to the resort? If you are flying into the Philippines with the intent to go directly to the resort, you are advised to book a flight straight to Cebu or alternatively Tacloban where we can have a van pick you up. If you are coming from Cebu, you will have to take a fast ferry to, Hilongos, Maasin or Ormoc City. For more details, refer to our section on how to get here. Will someone meet me at the ferry terminal? Yes, by arrangement. Just give us the details and we will meet you there. Note: We charge P1,800 per trip for Hilongos, and P3,500 for Ormoc City , P1,000 for Maasin and P4,000 for Tacloban. Please note: Each van is capable of carrying up to 7 people. Charge is per van not per person. Yes, we accept major credit cards. You can also pay in local and foreign currencies. What water activities are available? The area’s diverse underwater terrain presents several unique diving challenges and opportunities. There are also many rich snorkeling grounds. Whale shark watching is usually guaranteed between late October and early May and some sightings possible in the off season. Dive sites such as Napantao sanctuary ,Maxclimax sanctuary and our macro dive at the Jetty are now becoming world famous. Am I assured of seeing whalesharks? We can not guarantee that you will see whale sharks during your stay as many factors must be considered: plankton, the weather — and plain good luck. But last year our success rate on whale shark day trips was around 95% . We hope it will be the same this year. I sent you an email, but you never wrote back. Why? If you sent the email using our contact form, you should receive a server-generated response at the address you provided. If you did not get one, you may have mistyped your email address. You will have to send the form again using a valid email address.